The pavement rollout was exciting for two things. 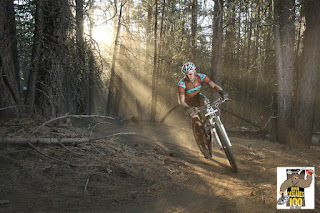 You know how mountain bikers have a rep of not knowing how to ride in a pack? And how it's 5:30 in the morning? And they have hydraulic brakes that could probably stop YOUR CAR, nevermind their bikes? So of course some dude decides to fall asleep while riding in the middle of the pack and when he wakes up he notices his front wheel is mere inches from the guy in front of him (the horror!) and decides to handle this situation with the DOUBLE WHEEL LOCK-UP. Good times, my mountain biker buds! Meanwhile some dude in a Strava-Pro jersey managed to find the only downhill on the road section and pee on the shoulder while riding, which is quite impressive to me. Someone quipped "he's marking his territory on this segment!" ANYWAY soon we turned on to a much narrower and sandier doubletrack trail, and the people who couldn't actually handle their velocipedes were quickly outed the first time we hit a mildly washed-out climb. Those people sprinting while pushing their bikes next to me raised some questions about their pacing. 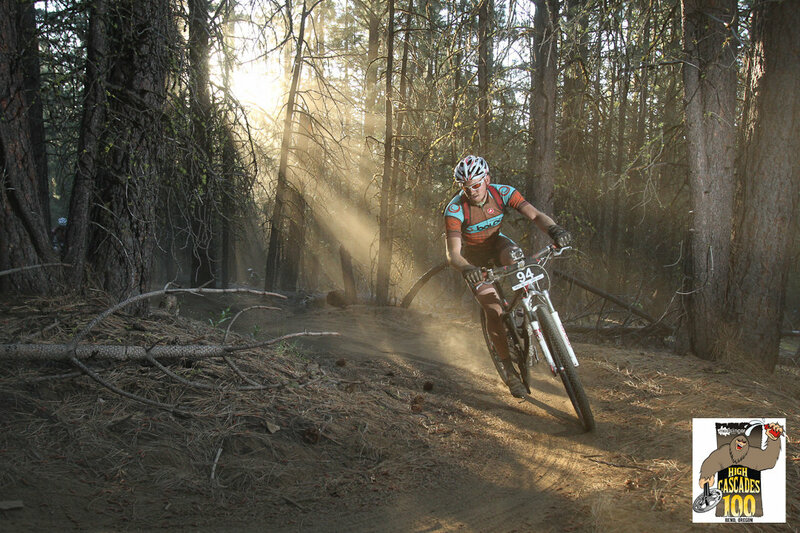 We hit the singletrack and things got DUSTY! It's now 6:15 AM and the dust clouds are getting lit up by the sun, which has just poked over the horizon to the east. Guess which way the trail is going? EAST. I did a disturbing amount of riding based on the assumption that the guy ahead of me could see where he was going. And since we were in a line of 20 riders, he was probably doing the exact same thing. Meanwhile, when you got the sun behind you, the epic-photo opportunities were excellent! I realize I have barely acknowledged that I have a brother in this race, and that is because this is a blog about ME and how AWESOME I am and the fact that my little brother is a BETTER ATHLETE is immaterial, you know? But I did briefly run into him at Aid 1 (18 miles! ), which meant things were actually going okay. Unfortunately he was leaving the aid as I was looking for a portapotty (coffee!!) and this was actually the last time I was going to see him all day. But whatever. The absence of portajohns led to me peeing behind a building, and forgetting to turn off my GoPro while I did so, which led to me videotaping myself peeing. While you can't see anything, the video is still so creepy to me I can't even post a screenshot. Eeeeesh. After Aid 1 was the only other dirt road section of the course, 5 miles of fire road on which we had been encouraged to "have breakfast." I dutifully rode slowly while munching on an egg sandwich, while a bunch of JERKS were slamming down gels and ATTACKING ME in the feed zone. Jerks. I think I eventually caught 100% of those jerks, probably because my bacon was way better than their sugar. Somewhere in here we hit 30 miles, Aid 1A, and finally stopped effing climbing for the first time in like, 3 hours. A dude went over his bars under braking for no apparent reason, too. Of course my camera was off. Then there was a solid 10+ miles of gradual descent on a trail I had never ridden, where would shred every 3 corners, picking up speed, until overcooking the fourth and coming to a stop. Eventually I accepted the fact that I wasn't Adam Craig, started braking more, and HEY! If you stay on the trail and descend SMOOTH, you can pass a lot of people! At mile 43 the radness was over (also: washboard into banked, sandy corners, on a hardtail, in a 100-miler? not rad) and now we had a sweet 2000+ foot climb up to the "lunch" aid station at mile 56. This is where I went to my "dark place," predictably, because 43 miles on a mountain bike is already my longest MTB ride in five years, and I WASN'T HALFWAY DONE YET. Also, I had to climb for literally 90 minutes straight. And my bad knee hurt. James Harmon (whom I was somehow magically ahead of?) crushed me on a singlespeed. Like all good climbs on trails you don't know, there were roughly 9000 false summits before finally reaching the top. Once at the top, however, things were suddenly looking up: I was at the high point of the course (so it's all downhill now! ), I was at mile 56 (so I'm basically done! ), there was a bathroom (so I'm about to improve my w/kg!) and Christin was there with a variety of snacks for me. Here I am, casually lunching on a sub while tons of people whom I passed in the last two hours are passing me back, with their far more efficient aid station timing. I also have apparently been sweating and riding in other people's dust a little bit. After 11 minutes of wasting time and telling my support crew stories when I should have been chewing, I left the aid and headed off onto the raddest part of the course, the Metolius-Windigo trail down to Lava Lake (see 4:00 into this video for Barry Wicks on it). Christin and I had pre-ridden this part on Thursday so I knew exactly how good it was, dropping 1800 feet in 14 miles of sandy, twisty, lava-y awesomeness. It had plenty of little climbs in it, but I was going XC-hard because it was so FUN and I was FLYING. And I had a lot of time to make up after my lackadaisical feed zoning. The cool thing about hundies is that everyone just GETS OUT OF THE WAY if you come up behind them. All those dudes I let past on the climb would just PULL OVER the second I chain-slapped up behind them and said "pass when you get a chance?" On two occasions, guys actually CRASHED in their haste to get out of the way. Awesome? So I had about an hour of euphoria in which I passed a lot of people and decided that I was the best hundred miler racer ever. Then I hit mile 70, declined the feed zone (well, I took a HIGH FIVE handup, because I was feelin' good!) and headed into the Lava-Edison climb. A thousand feet in four miles, yay, but also the last big climb before the end. I dumped more gels into my system and got my suffer on. Forty minutes to the top, and I only walked, um, four times? There were some other guys out there with me, and I was relieved to find out that I wasn't alone in my riding-to-survive method of climbing. We were now in our seventh hour of bike racing, and somehow, my body was continuing to function at a reasonably high level. On the fast descent I noticed my first cramps, but hey, 7 hours to cramping? That's a record! 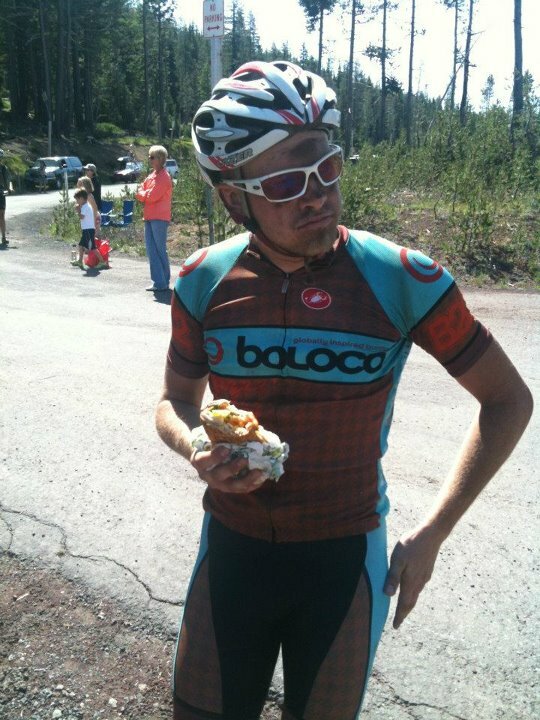 Plus I had a special pickles-and-coke feed lined up at mile 81, and pickles are a magical cramp-curing elixir. Mile 81 sounds awfully close to mile 100, and Bend is WAY LOWER than these "High Cascades" I'm riding in, so I decided that the final 19 miles were all downhill. I ditched my camelback, grabbed one last gel, slammed some pickles, threw a bottle of coke in my cage and was OFF! in my fastest aid station of the day by far. Back onto a trail I wasn't familiar with, and as miles 43-56 taught me, trails you don't know are EVIL. I knew that at some point we had to drop 2k+ feet down to Bend. I assumed this would start immediately. IT DID NOT. Instead, we had 5 miles of off-and-on climbing up to Kiwa Butte, which at the time I decided was "like a thousand feet." Later GPS investigation shows it was a mere 600-ish, but shut up, I was cracking, all right? My decision to ride with only a half-small-bottle of coke was immediately shown to be idiotic, as I was now looking at rationing 8oz of gross sugar water for the final 2 hours. GREAT DECISION MAKING, COLIN. Even after 8 hours of racing there were still dudes to ride with, which was fun, but I was now wobbly enough that I couldn't stay with anyone climbing. But finally! The big descent to the finish started, and no matter how bonked I am I still know how to GET OFF DA BRAKES. So all the jerks who dropped me climbing kindly got out of the way when I asked, and I said "thank you," because they weren't really jerks. I really wanted to be done so I really didn't use my brakes very often. I had also ditched all my flat-fixing stuff with my camelback, so obviously, in the final mile of descent, I tagged my rim on a rock at like a zillion miles an hour and had a heart attack. Good thing tubeless is magic. Then it was a very painful 5 miles on the road back to the finish, culminating with one last singletrack section. I gave it hell on the road for no apparent reason, but I needed to give it slightly more hell, as I finished in 9:00:10, missing the glorious sub-9 time by ten seconds. No, wait, I still can't make myself care about that. My brother beat me by like 20 minutes. Barry Wicks beat me by like 100 minutes. I didn't care. It was super freaking awesome and this event is my new Birkie. Christin was an awesome support crew but I am making her race this in 2013. SEE YOU NEXT YEAR! BIKES!! Post-race "exit interview" where I make barely coherent "jokes:"
Hey, improving your W/kg works BEFORE you get to the high point of the course. Just think how much faster you could have gone down if you held it a bit longer! So you and Blazar both have little brothers with more talent? Looks like you had great day and finished on good position too.